1775 James Watt invents the steam engine. 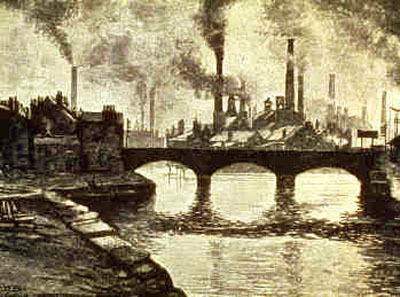 Industrial revolution begins in Britain. 1789 Start of the French Revolution. The Estates-General becomes the National Assembly. Parisian masses storm the Bastille. 1791 Louis XVI tries to flee but is recaptured. 1793 Louis XVI guillotined. Concerted attack by European armies on France. Jacobins and the Committee of Public Safety take power. 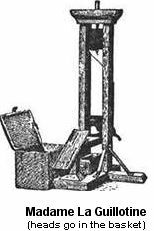 1794 Terror reaches its height, mass guillotining. Ends when Robespierre is overthrown. 1795-6 France throws back the invaders. Napoleon gains prestige from his triumphant Italian campaign. 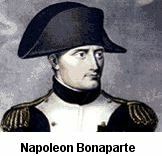 1800 Napoleon’s return from his Egyptian expedition restores French military fortunes. 1802 Britain is the last country to make peace with France, at the Peace of Amiens. 1804 A new coalition forms against France. Napoleon gathers troops at Boulogne and prepares to invade England by sea. 1804 Napoleon’s tunnel under the English Channel reaches its goal. French troops pour out and Napoleon marches on London. The working-classes rise in sympathy. 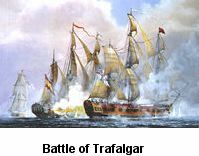 1805 Napoleon abandons invasion plans after Nelson destroys the French and Spanish fleets at the Battle of Trafalgar. Napoleon marches against the coalition and crushes the Austrians and Russians at Austerlitz. 1805 Napoleon’s conquest is interrupted when a new coalition of powers declares war on France. He returns to Europe and defeats the Prussians. 1806 Napoleon defeats the Prussians at Jena. When Russia makes peace, Napoleon’s empire appears invincible. 1806 British general Arthur Wellesley puts down working-class revolt and floods the cross-Channel tunnel. Napoleon defeats the Austrians and Russians. 1807 The remaining French troops in England surrender at Aylesham. Britain continues the war against Napoleon. 1808 Rebellion against Napoleon in Spain. General Murat leads the French forces there; a British Expeditionary force under Arthur Wellesley heads the resistance. 1809 Thomas Cooper builds the first steam locomotive. 1810 Holland rebels against the Napoleonic Empire. Britain sends a supporting force, which Napoleon annihilates at the Battle of Épernay. 1812 Napoleon marches his Grande Armée into Russia. His troops are decimated by cold, hunger and disease. 1814 Driven back and defeated by a general coalition, Napoleon abdicates. In Britain, the industrial revolution continues apace. Stephenson builds the first steam locomotive. 1815 Napoleon escapes from imprisonment on the Isle of Elba, resumes command of France, but leads his army to defeat at the Battle of Waterloo. His second abdication is final. The Congress of Vienna stabilises Europe in the interests of conservatism. 1815 onward. France begins to industrialise. 1818 Napoleon defeats a Pan-German coalition at Liegnitz. 1819 Labour unrest in Manchester is put down by gunfire at the massacre of ‘Peterloo’. 1819 Armand de Quesnoy develops rifling for gun barrels. 1820 onward. Prussia begins to industrialise. The introduction of explosive shells on the battlefield. 1824 Prussia and Russia rise against Napoleon while he engages in an attempt to conquer Turkey. The Grande Armée suffers a major defeat at Magdeburg. 1825 onward. France and Belgium begin to industrialise. 1830 ‘Moderate’ revolution and the establishing of constitutional monarchies in France and Belgium. 1830 onward. Russia and Austria begin to industrialise. The first motorised gun and mobile ironclads appear. 1837 Queen Victoria ascends to the British throne. 1838 Napoleon is old and ailing. Marshal Jeanjean suffers defeat at the Battle of Bratislava, but repels an attempted invasion of France. 1839 King George IV ascends to the British throne. 1840 onward. Annual famines across Europe as the effects of war and massive industrial pollution ruin agricultural production. The British Empire has virtually ceased to exist while the country has concentrated all its efforts on the struggle with France. Only a few ports and rump territories remain. 1842 Napoleon I dies and general exhaustion among the combatants leads to the Peace of Brussels. Napoleon II aspires to a place among the crowned heads of Europe and forswears revolutionary ideas. 1843 The British Parliament votes to begin the construction of the first juggernaut, Worldshaker. 1845 France announces a plan to build an even larger juggernaut, the Marseillaise. Britain upscales its own designs. 1846 Worldshaker launched. Prussia begins construction of the Lebensraum. 1848-9 Revolution throughout Europe; but conflicting nationalisms appear and most of the gains are lost. 1850 onward. Germany begins to industrialise. 1850 onwards . The Age of Imperialism, as juggernauts roam the globe in search of trade and raw materials. 1857-8 After the defeat of the Indian Mutiny, Britain takes complete control of India. 1864 Launching of the Austrian juggernaut, the Grosse Wien. 1874 Launching of the Russian juggernaut, the Romanov. 1870 Germany unified under Prussian hegemony; Italy completes its unification. 1875 Charvis Porpentine becomes Supreme Commander of Worldshaker, inaugurating a long tradition of Porpentine supremacy. 1880 onward. The high tide of Imperialism: European powers compete to colonise the remaining parts of the globe, especially Africa. 1914-18 World War I. 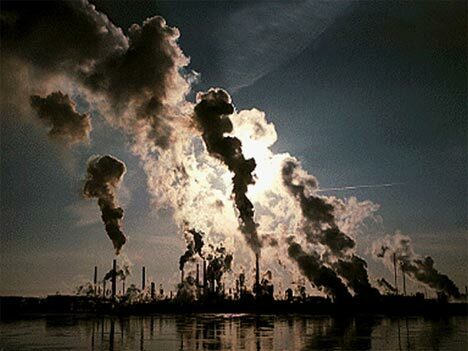 The new warfare of the industrial age produces a new scale of mass death. 1918 onward. The U.S. becomes the world’s major power, while Japan has also acquired new status. Imperialism wanes as more and more colonies bid for independence.